VietNamNet Bridge - QR Code can be used many times on one device, but the number of scans depend on the policies of mobile network operators. Viettel, VinaPhone and MobiFone, the three largest mobile network operators in Vietnam, all provide eSIM. Viettel said it will provide eSIM directly to clients at shops, before doing it online. However, as Vietnamese remain unfamiliar with eSIM, questions have been raised on hi-tech forums. What kinds of devices can eSIM be used on? How many times can each QR Code be used? Will users lose eSIMs if they delete all content and settings on iPhone? A representative of Viettel said the eSIM of the network operator can be used on iPhone 2018 series. “Viettel is going to support eSIM on other devices as well in the time to come, including Apple Watch and Android models with eSIM,” he said. As for VinaPhone, Cao Hung, a senior executive, said at present VinaPhone’s eSIM only operates on new-generation iPhones, including XS, XS Max and XR, not on Apple Watch. The iPhone XS, XS Max and XR will be the first devices to use eSIM in Vietnam. However, iPhone users have been warned that locked iPhone versions will be rejected. 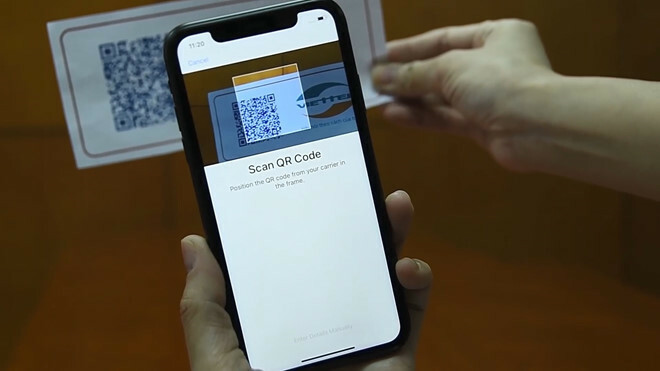 In this case, when scanning QR Code, users will receive a message that will say that it is impossible to add more mobile service packages from the same service provider. Hung explained that each QR Code can be used on one device. The system will download the code to the device many times. However, in order to make the service convenient to customers and ensure information security, the number of eSIM scans will depend on the policies of mobile network operators. Hung said that VinaPhone is collecting opinions from customers before deciding on a policy on the number of code scans allowed. Representatives of mobile network operators have denied that users will lose their eSIMs if they conduct the operation ‘delete all content and settings’ on iPhone. When showing ‘delete all content and settings’, iPhone will offer one more option ‘delete all but keep mobile service package’ which allows owners to continue using eSIM. eSIM is an alternative to traditional SIM card and it has been used over the last few decades. eSIM helps mobile devices connect mobile network operators’ services, just like micro-SIM and nano-SIM. Each QR Code is compatible with one device. This means that when using another device, users will have to use another QR Code.